"Say cheese ! " .Those were the two words that my ears heard for the first time ever in my life that gave me a vague idea about "cheese" . My hi-fi IQ ,when I was a little girl with a developing brain and neurons ,even thought "Cheese" was in fact the present tense of the word "Choose" ;like ,Cheese,choose,chosen !! It was during my favorite part of going to school - "Lunch breaks" ,that I realized, there is another story behind the word "Cheese" .Being brought up in North India ,most of my classmates were North Indians,whose lunch box emitted that mouthwatering aromas since first period of the class itself and made me utterly restless and piqued my curiosity until the lunch break. Being a South Indian,my lunch box used to be mostly Idli-dosa which my North Indian friends were crazy about and being scared of their craziness ,humble me would always giveaway my lunchbox without even being asked for and the biggest reason being,how else would I return my lunch box to my amma darling completely clean and done . As I grew up,whenever I went to my friend's birthday parties or a North Indian wedding or festivals I would again come across these white square-y things swimming in different curries respectively. One day my friend said, "Paneer khaogi?" /(Wanna eat Paneer?) .Since it sounded like Paani meaning water in Hindi and even Neer meant liquid,I thought ,it is some kind of North Indian drink ! Yes,You are right - My hi-fi IQ !! Later in the evening,my friend finally introduced me to those square-y,cube-y things drowning in those curries as if crying SOS .She said,"Ye le Paneer,aaj maa ne fresh banaya hai! 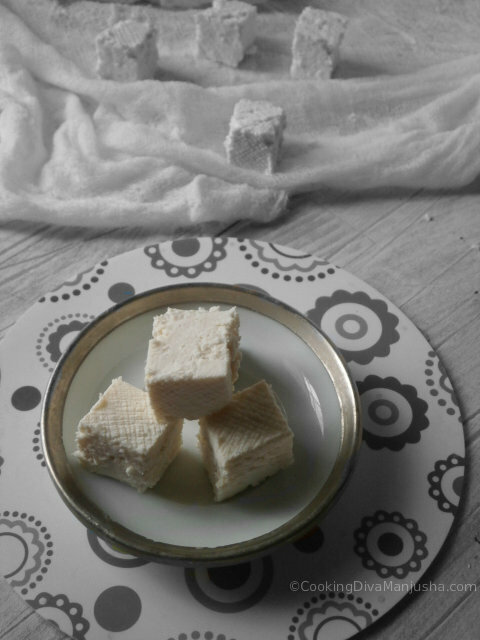 "( Mom made fresh Paneer today-try it! ).Aaaahann..and finally I had my tube lit moment ,that's exactly the mystery behind Paneer was finally solved. 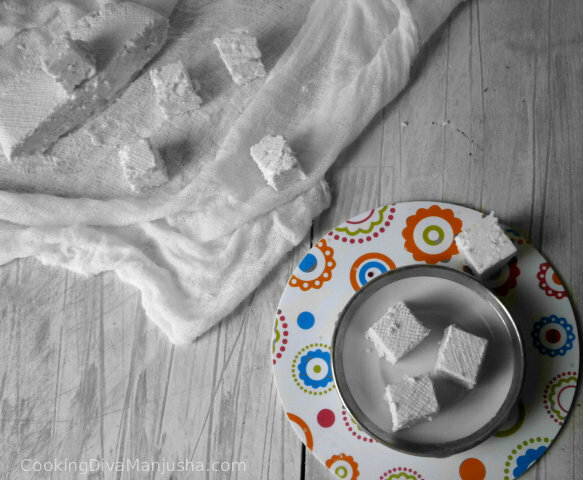 My amma never made Paneer or any paneer related curries as far as I can remember.That was the main reason why I never knew about these square-y ,cube-y whitey paneer . 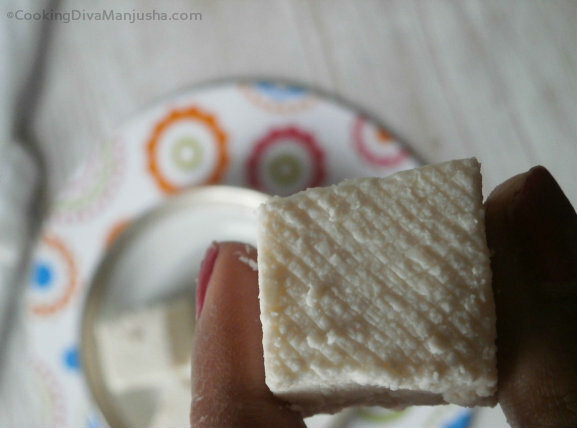 However, the taste of those fresh homemade paneer always lingered in my taste buds forever. I did try some store bought ones ,but they failed to impress my palate and rekindle the fresh homemade paneer's taste.It was after I became the ultimate in charge of my wonder kitchen(my old blog's name ) in U.S. ,that I tried my hand referring to different recipes online ,failed sometimes ,proving this saying wrong,"Don't cry over the spilt milk ", and that saying right ,"Practice makes a man/woMan perfect " and eventually,came out with a successful way of making paneer at home. 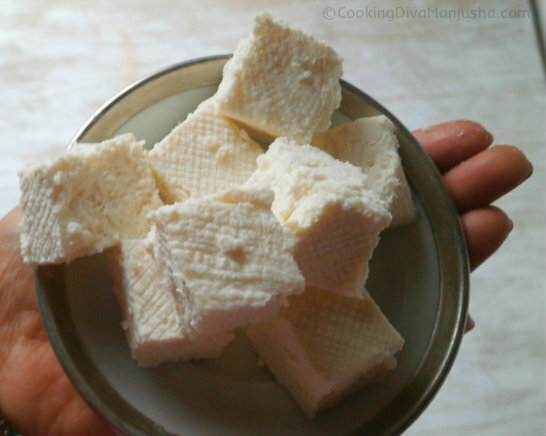 To those who don't know,Paneer is the famous ,one and only Indian cheese ,that can be easily prepared at home .All you need - Milk,any food acid like lemon juice,vinegar,yogurt or even with any leftover whey etc ,Muslin cloth and colander. 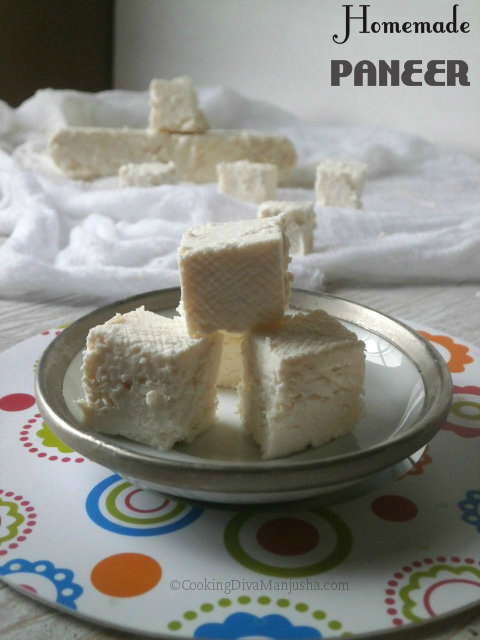 Paneer is widely used in North Indian dishes due to the eminence of milk in their cuisine.Paneer/Panir is in fact the go-to cheese in most of the South Asian countries . There are two types though - Firm paneer/Ponir/Panir used in different curries and soft paneer known as "Chenaa/Chhena or Chhana" used for making delectable sweets/ North Indian desserts. Paneer is in fact a very protein rich food with many health benefits ,though not that calorie-friendly.It is most sought after protein for non-meat eaters/vegetarians and equally enjoyed by the non-vegetarians as well.Paneer curries despite of being sumptuous and expensive,rules every menu in most of the Indian restaurants all over North India. In US,I've seen my American friends who are equally if not the biggest fan of this Indian cheese .The reason being the simplicity and the "It factor" that this cheese is an un-aged,acid set and can be made by anyone at home with a few fresh organic ingredients,totally preservative free. So,you see, how in the world ,I could have not tried my crazy hand and come up with the foolproof recipe to make Paneer with milk in my humble abode . Method: Pls watch my quick video that will show you clearly how to make it properly . Always use Organic whole milk ,but if you are calorie conscious, you can use 1% or 2% fat reduced milk.The skim milk,fat free milk or the Ultra Heat temperature(UHT) pasteurized milk will not yield apt paneer cubes as hardly any cream will be left in such milks.